This paper analyzes the origins of currency crises for 20 OECD countries and South Africa from 1970 through 1998. The main contributions are in three areas. First, it tests for contagious crises and attempts to recognize contagion channels by employing a duration analysis. Second, to minimize the concerns regarding the accuracy of identified crisis episodes, our paper uses crisis episodes that are identified by a relatively more objective method based on extreme value theory. Third, we make use of several robustness checks, including running our models on two different crisis episodes sets that are identified based on monthly and quarterly type spells. Our findings show that high values of volatility of unemployment rates, inflation rates, unemployment rates, real effective exchange rate, trade openness, and size of economy, and contagion factors (which mostly work through trade channels) increases the hazard of a crisis. Keywords International finance, exchange rate, crises. Karimi, Mohammad, & Voia, M.-C. (2011). 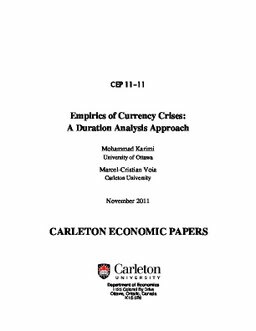 Empirics of Currency Crises: A Duration Analysis Approach (No. CEP 11-11). Carleton Economic Papers (CEP). Department of Economics.